Hawaii Native Status: Introduced. This naturalized ornamental garden plant is native to Central and South America. Description: The umbellate flower heads are typically multicolored since the individual flowers open orange or yellow and then turn pink when pollinated. The nectar-filled flowers are tubular with 4 lobes. 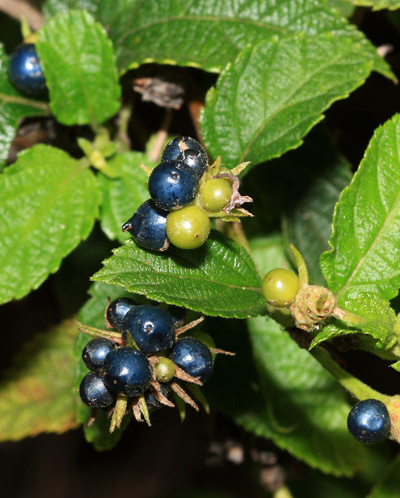 The fruits are small, blue-black drupes beloved by birds. The leaves have toothed or scalloped margins and are simple, opposite, oval to oblong in shape, and covered in rough, scratchy hairs. The woody branches are long, brittle, weak, and may be erect or rambling. 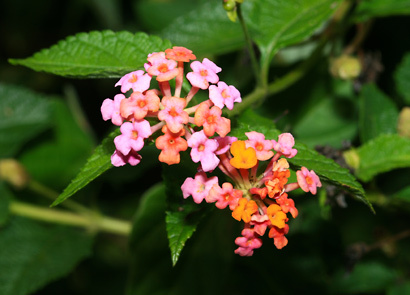 Here in Hawaii, Lantana is an invasive weed, and it's especially a problem in pastures because it is poisonous to livestock. Birds love the ripe berries and are responsible for dispersing the seed. 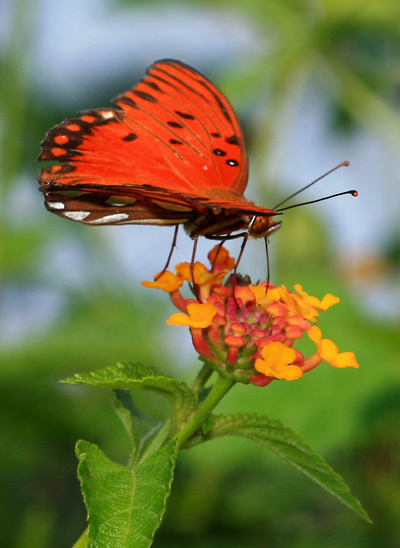 Butterfly Plant – The flowers attract butterflies like the Gulf Fritillary (Agraulis vanillae) above, which is why this plant is a frequent addition to butterfly gardens. Foul-smelling – The rubbed or crushed leaves have an unpleasantly pungent smell. 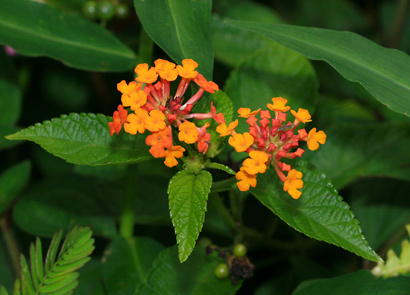 Poisonous – The foliage and the green, unripe berries are poisonous and contain the toxin lantadene.